There's a lovely plot of land about 16 light-years from Earth, free of yelling fanboys and face computers, and scientists consider it a prime candidate for life. The potentially-habitable super-Earth, Gliese 832-c, is still much too far for humans to visit—with current technology, it would take us thousands of year to get there. But it's exciting because it's yet another mystery brought to light by researchers. Is there life beyond our Blue Marble? We continue to find evidence that suggests the answer is yes. The new planet is about 5x the size of Earth, and is suggested to have an orbital period of 36 days around its nearby red dwarf star. 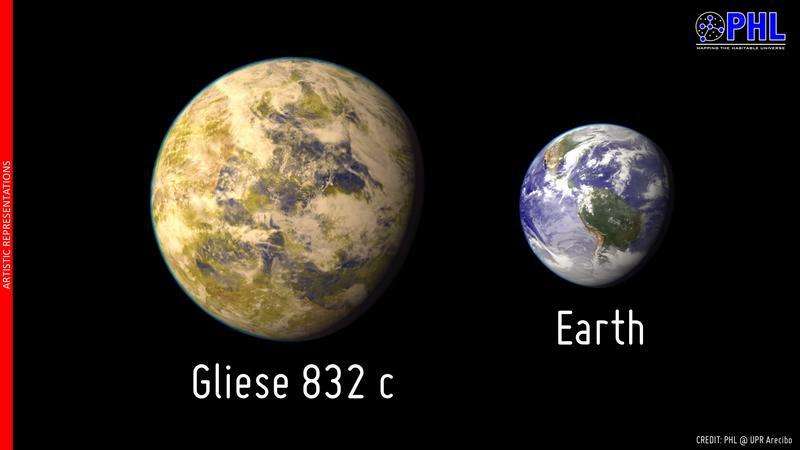 Gliese 832 c is considered to be one of the closest and best habitable-world candidates so far, and is thought to have Earth-like temperatures. The thing about it, though, is that scientists believe it features drastic seasonal shifts. But that's assuming it has an atmosphere similar to Earth's. Researchers still aren't quite sure. "Gliese 832-c seems to have the right temperature for life but not necessarily the right size," said Abel Méndez, speaking with io9. "It could be a gas or water world instead of a rocky world but we simply don't know now. The orbital eccentricity of Gliese 832-c might cause large season temperatures changes but not enough to preclude life. A dense CO2 atmosphere could make this planet too hot for life anyway." Per Robert Wittenmyer, who was involved with the study of Gliese 832-c, scientists are intrigued by the planet because it "receives roughly the same amount of energy from its star as the Earth does from the Sun." However, just because it's being considered "potentially habitable" doesn't make it a sure-fire candidate. The habitability depends on the planet's atmosphere; Wittenmyer compares our Earth to Venus, and says this could be a similar case. Earth and Venus look identical, though Venus has 90 times the atmosphere, meaning the planet isn't conducive to life. Wittenmyer says it would be able to figure out Gliese 832-c's atmosphere if it were to transit across its host star, but it doesn't do that, so researchers are left to speculate. Super-Earths are still considered a "mysterious class of planet," according to Wittenmyer, so it's difficult for scientists to determine if these planets are indeed habitable. Still, the mere thought that there might be a planet out there exactly like ours is enough to keep looking.